The unique and wild Isle of Rum nestles in the Inner Hebrides. Rising directly from sea-level, the Rum Cuillin dominates the skyline. The main part of this ridge is around 10km, with some exciting scrambling guaranteed ! 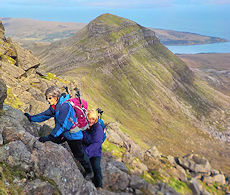 Rum's Cuillin ridge forms a natural horseshoe route, starting from Harris on the south-west of the island. 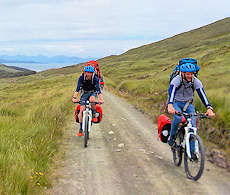 We're biking to Harris and setting up a three-night camp there, from where we'll aim up the rugged peaks on the island. 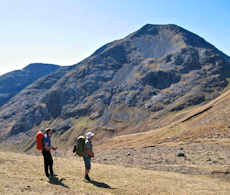 This 4 day event is a guided hiking holiday with one of our experienced and qualified guides. Your guide will know the remote area well and be able to give you insight into the flora, fauna and geology. 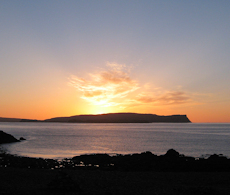 The package includes 4 days guided biking, hiking and hill-walking and the Calmac Small Isles ferry costs from Mallaig to Rum. Our camp location is at Harris, to the west of the Rum Cuillin. A fine track which travels through a delightful wood, then passing remnants of the estate's sporting past, leads down to Harris bay with it's lonely cottage and weird mausoleum. We'll meet up late morning in Mallaig from where our boat takes us out to the isle of Rum. The journey takes a bit over an hour, giving us a chance to get to know each other, discuss kit and plan the days on the hills. We arrive at Rum's harbour early afternoon, from where we have a leisurely cycle along fine tracks to Harris at the south-west of the island. We'll set up camp and relax for the evening. 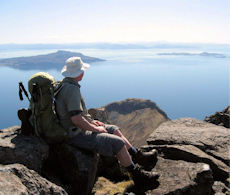 Our primary goal for this event is to traverse the entire Rum Cuillin ridge. This is a superb and varied route with some fine scrambling on the crests. From Harris bay, your guide will lead you onto the Rum Cuillin ridge and up the Norse named Corbett peaks of Askival and Ainshval. This is a hands-out-of-pockets day, where we will be rock-scrambling on narrow crests. There are paths avoiding any difficulties should weather dictate a more cautious approach ! Hopefully our efforts will be rewarded with superb views over to the Skye Cuillin and Knoydart. Although not as high as the Rum Cuillin, the peaks on the western side of Rum have a wild charm of their own. They are rugged, quiet and have stunning views from the summits and crests. After a well-rested night at Harris, we'll set off up pathless terrain onto the southern shoulder of Orval. The grassy summit, with its trig point and cairn is a lovely spot to take in the vast vista. Look for the Northern Pinnacle at the end of the crags below. We'll trace a route to the lonely bothy at Guirdil, then return back to Harris for a final night camping under the stars. A visit to Kilmory's white sands are a must before aiming home ! The white sands of Kilmory can sparkle in sunshine. The view out over the clear seas and crashing waves to Skye is stunning. We can also find out about the research work SNH gets up to around the bay ! Our return ferry leaves late morning, which leaves time for a bit more exploring if we get up early. We'll bike back up along the track, then down to Kilmory bay to explore the area and take in some views. Back to the harbour, we'll hopefully have time for a snack in the cafe before getting back on the ferry to Mallaig. For the most part, the routes are on fine tracks in the glens, leading up grassy slopes to mountain crests and ridges. We've classed the main Rum Cuillin day as 'demanding' which also has some rock-scrambling up to Grade 1 with some variations at Grade 2. For the days on the hills you'll need your general hiking gear appropriate to the conditions and time of year. More information and a checklist to download can be found on our Mountain Gear page. You'll also need backpacking and camping equipment for our overnights' stay. A list of backpacking kit, along with hints, advice and a checklist is on our Backpacking Gear page. 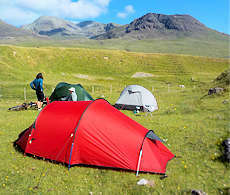 We can hire you a package of tent, sleeping mat and cooking equipment for £25 per night. A bike will also be needed, though should you prefer to walk, we can meet you earlier and arrange meetup points. Bike hire can be arranged on Rum - Rum bike hire. We get the ferry from Mallaig, which is around 45miles west of Fort William on the A830. There are good public transport connections (bus and train) to Fort William and Mallaig. Food for your days on the hills and meals at camp can be bought in the large Co-op supermarket in Mallaig by our ferry departure point. Rum also has a well stocked shop adjacent to the village hall at Kinloch. There is a coffee shop in the hall. Below is a list of accommodation that previous guests on our trips have recommended for staying in prior to and after the event. Other accommodation can be found at Visit Scotland.